Product Line: You've Been Sentenced! 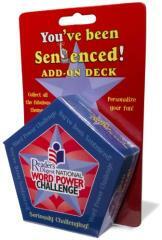 If you love playing the game "You've Been Sentenced," you will love this Reader's Digest National Word Power Challenge add-on deck! This deck features 80 new cards and 400 words (A-L) that were picked from 10 years' worth of Reader's Digest Word Power Range pages. These words are the most challenging and high-scoring available! This add-on deck is designed to be used in conjunction with the original "You've Been Sentenced" game, which is sold separately and required for use. The add-on deck is a great way to increase the challenges associated with the traditional game and expand your vocabulary.